In what is one of the last tune ups for many Olympians and Olympic hopefuls, the Arena Pro Swim series heads to Santa Clara and will see quite a turn out. Nathan Adrian, Dana Vollmer, Anthony Ervin, Natalie Coughlin and Maya DiRado and Simone Manual are just some of the current Olympians who will compete June 3-5. Prelims are at 9 a.m. with finals at 5 p.m.
You can read more about the meet here. I took an extended weekend to play in the lovely city of Seattle, so I’m posting various links on Nathan Adrian’s wins from last weekend at the Arena Pro Swim Series event in Mesa, Arizona, a little late. I watched his 100 freestyle and, again, he just absolutely smoked the field. What was impressive about that race was that while his first 50 was fast (22 seconds) his second 50 was nearly as fast. That is something that Nathan has been working on — making sure his back half is just as strong or stronger than his first 50. At this point in the season you want to see improvements there so this is good news for Nathan. 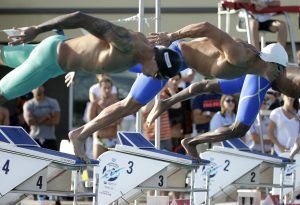 He finished in 48.00 to tie with Frances’ Florent Manaudou for the fourth-fastest time of the year. And if you can smoke the field in a 50 free, Nathan did just that winning easily in 21.69. It was the third fastest time in the world this year. Watching that race, he looked just as smooth as always with very little wasted effort. As far as the series goes, Nathan still holds the overall lead with 40 points. He has double wins in four events now — Minneapolis, Austin, Orlando and Mesa. He has collected $8,000 in prize money to boot. And you can check out all of Nathan’s swims on his YouTube channel here. Bremerton’s Olympic champion Nathan Adrian will compete in this week’s Arena Pro Swim Series event at Mesa, Arizona. Adrian is seeded first in the 50-meter freestyle, which is Friday, and in Saturday’s 100 freestyle. 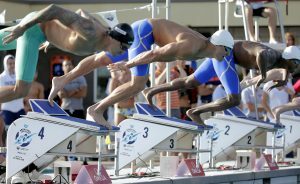 A live webcast of the entire meet can be seen on usaswimming.org. The meet is being televised (tape delay) on NBC Sports Network at 3:30 p.m. Saturday and at 9 p.m. Sunday. The Mesa meet is the fourth in the series and features a record $350,000 in overall prize money. Adrian leads the male standings with 30 points.